It's a detail cart and pad washing station in one! 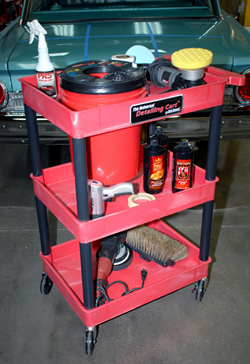 The Grit Guard Universal Detailing Cart makes detailing and cleaning up easier than ever! In addition to being a large, multi-tiered, rolling cart, the Grit Guard Universal Detailing Cart is specially designed to accommodate the Grit Guard Universal Pad Washer. Now your detailing products, tools, and pad washer are all within easy reach while you work. The Grit Guard Universal Pad Washer was developed to make cleaning pads quicker and easier for busy detailers. Since the Universal Pad Washer was invented, it has become a staple in the garages of hobbyists and professionals. Now Grit Guard has come up with another innovation to make using the Grit Guard Pad Washer even easier. 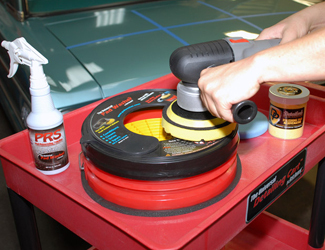 The Grit Guard Universal Detailing Cart is a detailer's best friend. The cart has three shelves to hold polishes, your buffer, pads, and towels. Each shelf has a raised lip in case something spills or rolls; it won't end up on the floor. The cart is made of highly durable thermoplastic that's easy to clean up. 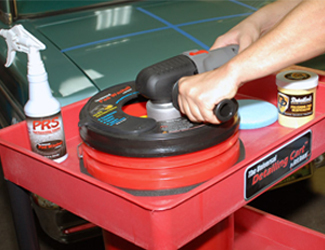 Rounded edges minimize the chance of scratching or marring the paint if it bumps your vehicle. 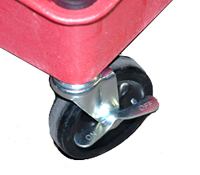 The Grit Guard Universal Detailing Cart has locking swivel wheels. In addition, the Grit Guard Universal Detailing Cart has durable ball bearing, swivel casters. The multi-directional casters make it easy to maneuver the cart around your work space, and they lock to prevent unintended movement of the cart. To top it all off, the Grit Guard Universal Detailing Cart has a cut-out in the top shelf for the Grit Guard Universal Pad Washer. The cart puts the pad washer at a comfortable height. You no longer have to bend over and use it. After all the work you put into detailing a vehicle, the last thing you want to do is bend over to clean your buffing pads! The Grit Guard Universal Detailing Cart puts the Grit Guard Universal Pad Washer at a comfortable height to make it easier to clean and dry buffing pads. 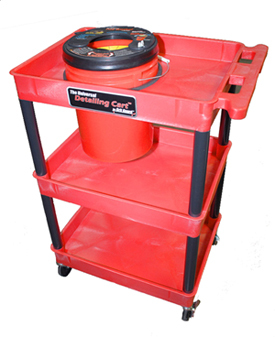 The Grit Guard Universal Detailing Cart provides detailers with an organized detailing work station where all commonly used products can be stored close at hand, including the Grit Guard Universal Pad Washer. Some products just make sense. The Grit Guard Universal Detailing Cart is one of those intuitive products that can make a real difference in your productivity. Try it and you'll wonder how you worked without it! Grit Guard Universal Pad Washer sold separately. This item ships from the manufacturer via ground service. Expedited and international shipping are not available.